Showing 1 - 4 of 4 Products for Fuel Injection Throttle Body Spacer. 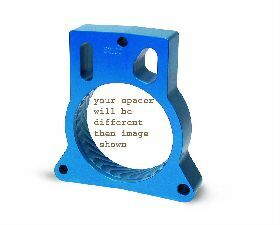 The Powr-Flo spacers bore is designed to increase the velocity of the air flow into the intake manifold. By delivering the air with more velocity it allows more air into the combustion chamber for a denser air charge. The design results in improved throttle response and impressive power gains in the mid range and top end. In addition, the increased air flow results in improved overall fuel efficiency. Simple, bolt-on installation with no other vehicle modifications required. Compatible with other aftermarket upgrades such as computer upgrades, cold air intakes, free flow exhaust systems, etc. Precision machined out of billet aluminum by Jet's in house CNC machine shop.